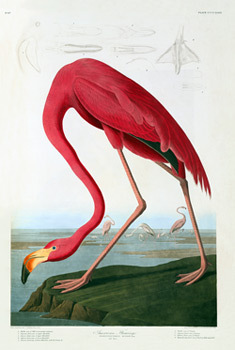 Audubon prints from Birds of America are in the public domain, meaning they are not subject to copyright restrictions. As a result, they have been reproduced countless times for nearly everything one could imagine: from coffee mugs and calendars to higher quality reproductions. Although the images are nonetheless enjoyable to look at, most of these images do not hold any value beyond the enjoyment of the admirer. Experts use a few methods to determine if a print belongs to one of the above groups including printing technique & the characteristics of the paper. Knowledge of printing techniques can be nearly enough for some sharp eyed professsionals. However, often it is the paper that yields the answer, especially for the novice. Watermarks and paper size are important when identifying an original. Many times, though, the print has been trimmed away and with it the correct dimensions and the watermark. In these cases, the value of the print is significantly reduced. Measure your print and compare the dimensions with the table above.